The past few days have been outrageously hot around Charleston and we’re not really ready for it yet. With daily temperates over 90° and heat indexes over 100°, it makes us want to stay inside. For those of us who have to work or play outside, you may run the risk of dehydration, overheating, heat stroke, and other heat illnesses. The staff of doctors at Charleston’s Alpha Care offices want to keep the Charleston community safe and cool, no matter what Mother Nature throws at us. 1. Stay Inside – As much as possible, stay inside in air conditioning and avoid the heat outdoors. 2. Drink Lots Of Water – Even if you aren’t thirsty, drink water to stay hydrated. 4. Take Frequent Breaks – If you are doing activities outside take breaks often so you don’t over work yourself. 5. Wear Light Clothing – Light, loose clothing is best to stay as cool as possible. 6. Stay Out Of Direct Sunlight – Head for shade whenever possible. 7. Never, Never, Never Leave Children In A Parked Car (Same For Pets) – The internal temperature of a parked car can reach 131 to 172° F when outside temperates range from 80 to 100° F and these levels can be reached in less than ten minutes. Body temperatures of children in cars can rise very quickly, causing serious problems. 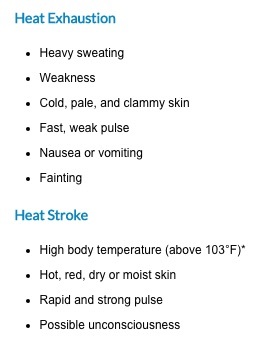 The Centers for Disease Control report that very high body temperatures can cause damage to the brain and other vital organs, as well as heat stroke and death. Learn more from the NHSTA. 8. Take Cool Showers/Baths – Cool showers can help lower high body temperatures. 9. Schedule Activities For Coolest Parts Of The Day – Early mornings or later in the evenings after sundown are the best times for outdoor activities. 10. Check Local News For Latest Weather Conditions – Check the local Charleston stations for heat index levels, heat advisories, and weather forecasts so that you can be prepared for the weather. If you are feeling the effects of the heat or need a health check up, visit the doctor’s at Alpha Care today. We are located throughout Charleston, SC in James Island, Mount Pleasant, North Charleston, and Summerville. Keep your family healthy and safe this summer. Call today at 843-824-2273 or contact us online. We are accepting new patients and no referrals are needed.